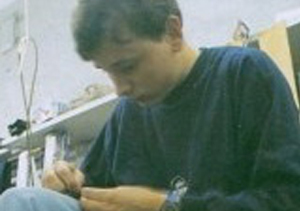 Here I am starting out on my tailoring journey in the year 1990 as a coat maker apprentice at Anderson and Sheppard. You will note that I have already adopted the classic position of sitting on the board whilst working. This picture was taken by a trade magazine and was my first experience of appearing in print.